IGGY POP’s 2016 ‘Post Pop Depression’ album was seen by many as his swansong with an also mooted retirement from the live arena because his failing eyesight meant that he had become unable to see the edge of the stage. 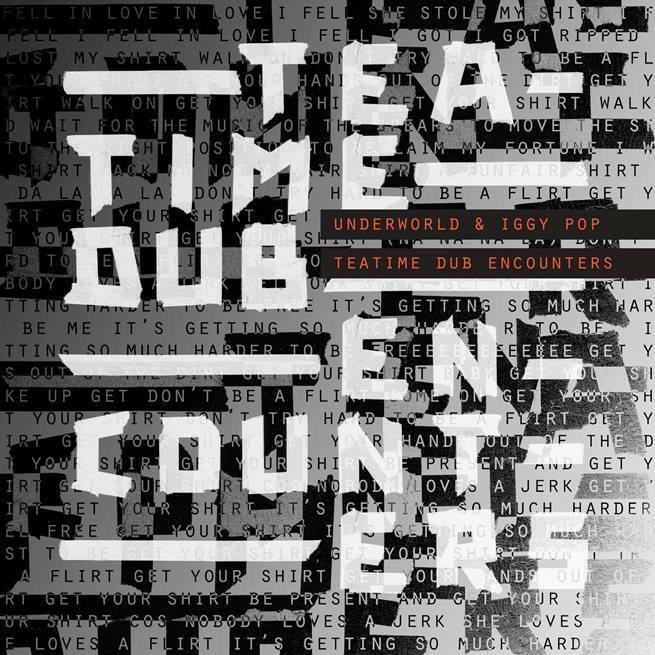 But in a surprising twist, dance legends UNDERWORLD have coaxed the 71 year old out of retirement and collaborated on the quintessentially British sounding ‘Teatime Dub Encounters’ EP. Comprising of four tracks, the EP clocks in at a lengthy 27 minutes and opens with ‘Bells & Circles’. An epic piece based around live drum loop samples and an entertaining rant from Pop revolving around “…the golden days of air travel”, topics taken in along the way include being able to smoke on a plane, whether the air stewardess was hot or not and doing copious amounts of drugs on the fold out table in front of the passenger. In typical UNDERWORLD style, the musicality of the track is slow building with layers gradually added with subtle strings, Hammond organ stabs and a “sunlight on my wings” semi-chorus hook in the end section. Rick Smith’s daughter Esme Bronwen-Smith provides backing vocals on the latter and features elsewhere on the EP. Second track ‘Trapped’ sees a surprisingly SUICIDE / DAF-influenced synth bass sequence make an appearance with a sung vocal by Pop and further backing by Esme Bronwen-Smith. Lyrically ‘Trapped’ gives a world-weary Pop another chance to climb on his soapbox and rant: “I’m trapped, I’m trapped and I’ll never get out no more”. The song also touches on that moment when you (or your kids) grow up, get a mortgage and become pinned down into an inescapable lifestyle with commitments that make you a slave to “the man”. Maybe vocally ‘Trapped’ recalls FOO FIGHTERS ‘All My Life’ a little too much, but the underpinning synth bass is wonderfully hypnotic and carries the track throughout. ‘I See Big’ see things take a downtempo turn, again based around spoken word, but this time in a more reflective manner with Pop ruminating on past friendships (both positive and negative) over a backing which features Krautrock elements, a hazy synth part and backwards guitar. The closing ‘Get Your Shirt’ musically references GOLDFRAPP, especially with Bronwen-Smith’s vocal part and Pop refers to the song as “a good old rock’n’roll moan about ripoffs”. With their independent appearances on the original iconic ‘Trainspotting’ film soundtrack, the two acts here are inextricably linked and there’s something brilliant about them finally collaborating. 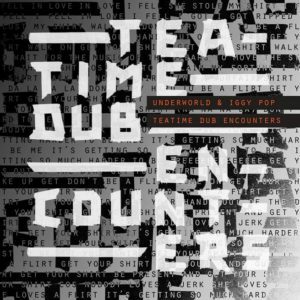 The deal breaker with ‘Teatime Dub Encounters’ is whether you happen to be a fan of IGGY POP’s vocal; one could either find it totally sublime or completely irritating depending upon your standpoint. 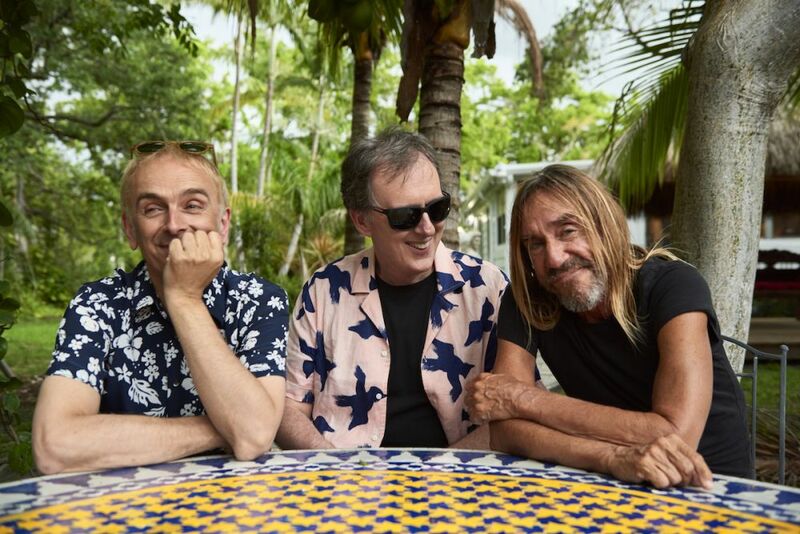 Musically though, this is interesting territory for both UNDERWORLD and IGGY POP; the EP has plenty to keep fans of electronic music happy, especially with the stripped-down Germanic synth-based groove of ‘Trapped’. On paper this collaboration shouldn’t really work, but in the main it succeeds wonderfully and will hopefully lead to further joint works between these two godfathers of their respective genres.